How can your company begin extracting value post sales? 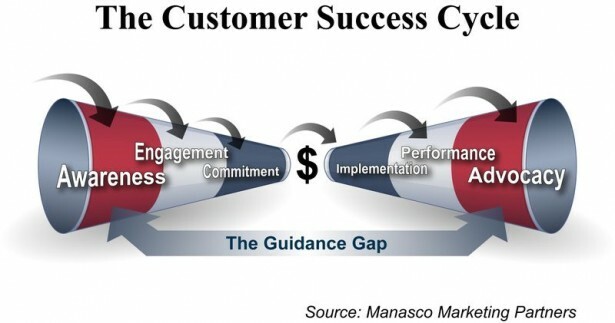 Britton Manasco published a post on Mastering the Customer Success Cycle. In the post, Britton stretches out the mind to encourage businesses to consider a different perspective on traditional buying cycles. Effectively, Britton splits up buying cycles into two larger phases, pre sales and post sales. In our article on pre-sales phases of the sales pipeline we cover stages prior to the sale (customer phase). Most organizations would agree that sales, marketers and services operate in different camps, feel they have their set of goals, and move on to the next pre-sales opportunity in the pipeline. The fact is, the job is just beginning and businesses that fail to align sales, marketing and services with customer performance and success lose a gold mine of value. Britton states there are three post-sale phases; implementation, performance, and advocacy. Implementation provides the proper guidance and support to help the customer get a solution up and running. Performance motivates companies to prove the benefits articulated in the pre-sales phase. Advocacy occurs once clients are delivering and achieving positive ROI. Only then, can your client become a proponent of your solution. We concur with Britton’s way of thinking and would like to expand his thoughts, specifically around the involvement and benefit of sales, marketing and services groups in the post-sales phase. In the section below we highlight ideas each group can execute to gain organizational alignment and achieve customer success. It’s imperative to note a few things. First, there’s no particular order for the execution of these ideas; however, it’s fair to assume services involvement is primarily in the implementation and performance phase whereas sales and marketing’s contributions are timelier in the advocacy phase. 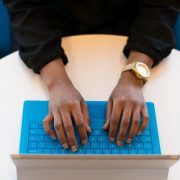 Second, collaboration across each of the business units is necessary to benefit from lessons learned and improve the likelihood of customer success. Training to help jump start adoption. Consultation on best practices and lessons learned from other clients. Further develop an understanding of client’s hurdles to adoption. Navigating client’s organization to identify PR contacts. Asking for referrals to other companies that could benefit from your solution. Asking client to act as a reference for future opportunities. As Britton puts it, become a “business coach”. Build the customer relationship further. Obtain feedback after the sale to help improve future pre-sales activities. Working with your client’s PR or marketing contact on joint press releases. Obtaining quotes from senior level managers for inclusion in marketing collateral. Recording video testimonials for inclusions in marketing collateral or websites. Aligning joint speaking opportunities at industry panels, conferences and seminars. Build a case study highlighting the client’s usage of your solution and extracted benefit. Measure ROI and compare clients return to the ROI initially conveyed pre-sales. Improve marketing collateral highlighting client’s favorite features and/or benefits. We welcome your feedback, comments and suggestions. How do you feel sales, marketing and services/support can be involved in the post-sales phase?